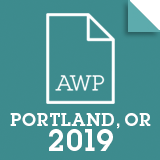 Portland will host the annual conference of the Association for Writers and Writing Programs (AWP) in 2019. The program includes many sessions dedicated to translation as writing, including a panel presented by NOTIS's Northwest Literary Translators. The AWP Conference & Bookfair is an essential annual destination for writers, teachers, students, editors, and publishers. Each year more than 12,000 attendees join our community for four days of insightful dialogue, networking, and unrivaled access to the organizations and opinion-makers that matter most in contemporary literature. The conference features over 2,000 presenters and 550 readings, panels, and craft lectures. The bookfair hosted over 800 presses, journals, and literary organizations from around the world. AWP’s is now the largest literary conference in North America. Join us in Portland, OR, in 2019 to celebrate the best of what contemporary literature has to offer. NEW! Join OSTI & NOTIS for a Literary Translation Happy Hour at McMenamin's Chapel Pub on Thursday, March 28, 5:00 PM! Details here. Here is a list of all translation-related sessions at AWP.